Sen. David Pryor is honored by the Board of Trustees of the University of Arkansas as Chair Emeritus. 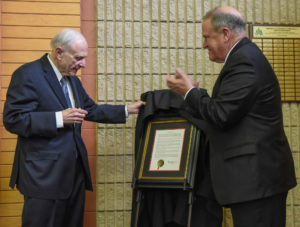 MONTICELLO — Longtime politician and public service veteran Sen. David Pryor was honored by the Board of Trustees of the University of Arkansas at the board’s recent meeting with a resolution naming him Chair Emeritus of the Board of Trustees of the University of Arkansas. 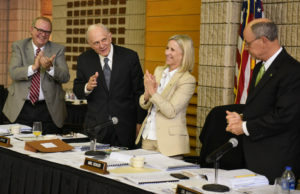 Current Board Chair Mark Waldrip read a resolution during Thursday’s meeting and also highlighted Pryor’s notable life and career, and added some personal comments to pay tribute. The full resolution can be read below. Current Board Chair Mark Waldrip presents Sen. David Pryor with a framed resolution signifying his adoption of Chair Emeritus. NOW, THEREFORE, BE IT RESOLVED BY THE BOARD OF TRUSTEES OF THE UNIVERSITY OF ARKANSAS THAT, on motion duly made and seconded, the Board hereby bestows upon Senator David Pryor the title Chair Emeritus of the Board of Trustees of the University of Arkansas. BE IT FURTHER RESOLVED THAT that the Secretary shall spread a copy of this resolution upon the minutes of the Board of Trustees of the University of Arkansas and shall send a copy to The Honorable David Pryor as an enduring pronouncement of the fondness and respect in which he is held by the members of the Board and the people of the State of Arkansas. Adopted this 29th day of March, 2018. UA Trustees to Hold Special Teleconference Meeting April 10 at 2 p.m.